Wild Weta Ltd are concerned about the effects that toxic chemicals have on the environment, people and pets. Toxic, poisonous chemicals are widely used in the pest control industry - but not by this company. Wild Weta uses its very own registered Erma approved compound formula in conjunction with gel baits and rodent baits for the different insect treatments. 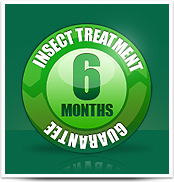 Our product contains a blend of highly concentrated Citronella, Pyrethroids, and evaporating agents to ensure a very effective long term solution to your pest control requirements without compromising the health of your family, pets and the environment. We can provide all necessary documentation including bio grow certification certificates and material safety data sheets confirming the lower levels of toxicity and safety aspects. Fully experienced and trained covering all of Auckland and beyond. Competitive prices and a friendly, honest, trustworthy service guaranteed. Contact us today!